A genuine and realistic guide on what to see and do with 2 days in Athens. This is the exact itinerary I used when my brother, nephew, and niece came over to visit me in Athens recently. As regular readers may know, I have been living in Athens for little over four years now. 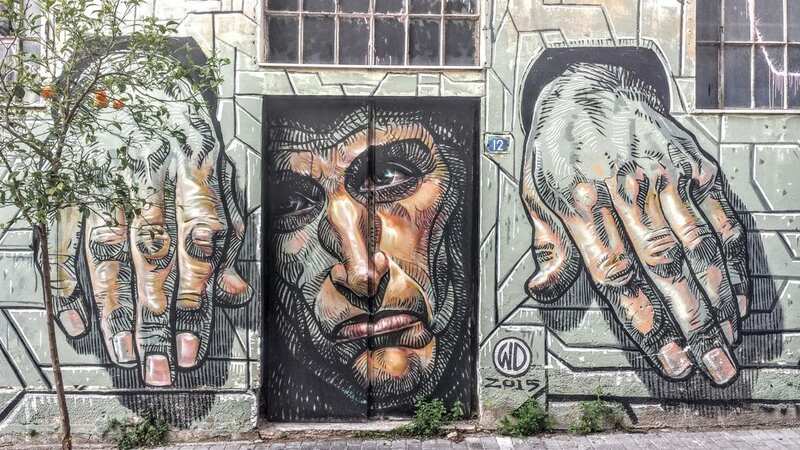 During this time, I've personally visited all the major historic sites in Athens, nearly 80 museums, dozens of art galleries, and discovered cool areas with street art. I'd like to think that this experience has helped me to put together a nice little itinerary of things to see and do with 2 days in Athens. I also wanted to show them some off the beaten path areas in Athens so they could get a feel for its contemporary side. This is where reality struck though. I mean, you can sit on your arse anywhere in the world, and make a list of what to do in Athens. There is a massive difference between making a list, drawing up an itinerary, and then applying it though. Especially when there are two kids, jet-lag, and some catching up to do! This then, is an Athens itinerary resulting from what we actually did. It is a genuine and realistic guide on what to see and do during 2 days in Athens, taking in most of the main highlights. If you are visiting Athens for a couple of days with kids, it might also prove to be very useful. Bought a koulouri or two from the seller opposite the entrance, and had a look at the square. Explained that this is where the majority of the political protests and demonstrations take place. Obligatory photo by the fountain, and then walked up the stairs for photos of the Parliament Building. Crossed the road, and found a good position to see the changing of the guards. The Tomb of the Unknown Solider is positioned just in front of the Parliament Building. This is guarded day and night, by two Evzone guards. On the hour, every hour, the guards change and is a spectacle not to be missed! We were there at 11.00 on a Wednesday. On Sundays at the same time, the ceremony is a hugely elaborate affair. If you have 2 days in Athens, and one day is a Sunday, be sure to plan your day around this! 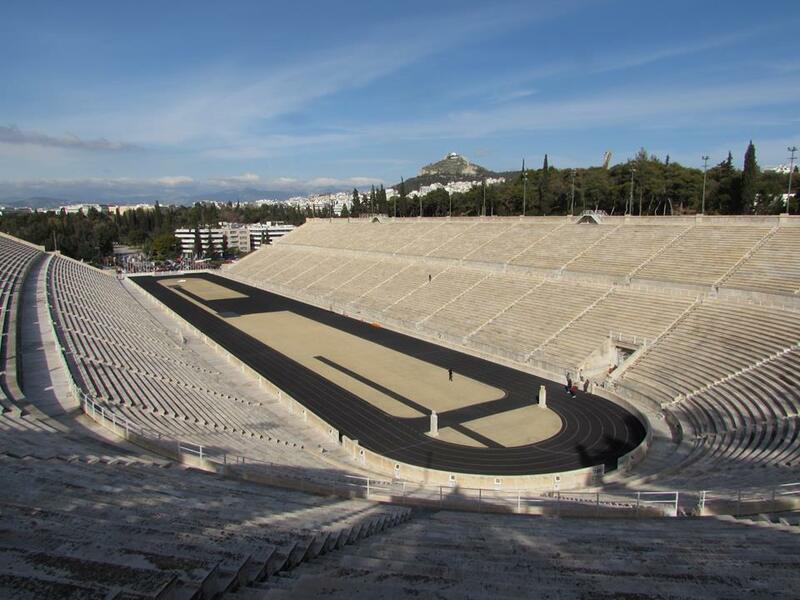 (Arrived 11.25) Being a sport family, my brother and the kids wanted to see the Panathenaic Stadium, which hosted the first modern Olympic Games in 1896. The walk from the Tomb of the Unknown Soldier took five or ten minutes. We dropped by the Botanical Gardens and Zappion along the way. You can pay to go inside the stadium and visit the small museum there. I've done this myself and found it very interesting. On this occasion, we decided against this due to time constraints, so took our photos, and walked on. (Arrived 11.45) Some people decide not to include this temple on their 2 days in Athens things to see list, but I think that's a mistake. To me, it is one of the more impressive temples in Athens. It may not be complete, some of the repair work may be questionable, but the sheer size of the columns is amazing. Additionally, you get a good view of both the temple and the Acropolis in the background if you choose your angle wisely! 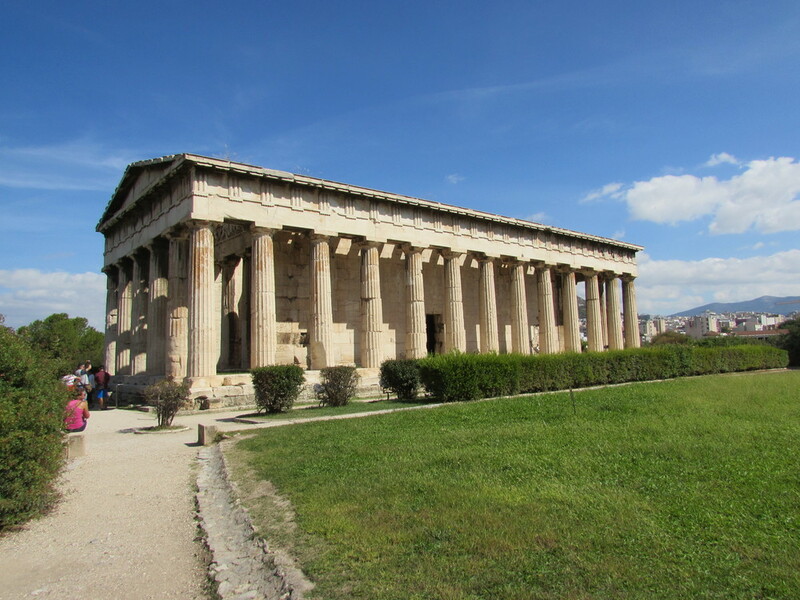 (Arrived 12.05) This is located just outside of the Temple of Zeus, and is on the walking route to the Acropolis. A quick pit-stop here. (12.15) After crossing the road, and heading to the Acropolis, it was time for an ice cream break. In all honesty, this area doesn't sell the best ice cream in Athens, but it was on the way! (Arrived 12.30) I would normally suggest avoiding this time of day during the hot summer months, but in February with 22 degrees, it was fine. For some reason, they are now operating two entrances to the Acropolis complex. The first area gives access to the lower slopes, and includes the Theatre of Dionysus, and the Odeion of Herodes Attikus. The Odeion is actually my favourite part of the Acropolis complex in Athens. We then had to exit the complex and walk a couple of hundred metres to another entrance to walk up to the Acropolis itself. It goes without saying, that you have to include visiting the Acropolis and Parthenon on a 2 days in Athens tour itinerary! In a way, I always find it more impressive looking up at the Acropolis and Parthenon than being on the top of it. It seems each time I visit, there are more cranes and scaffolding. Of course, there are parts of it which are amazing such as the Erechtheion. The views out over Athens are also amazing. (14.00) I wanted to leave the Ancient Agora until the next day, but knew we would have time to visit the much smaller Roman Agora before lunch. The Temple of the Winds has also been refurbished there, or at least that is what it looked like. Unfortunately, the site was closed for an unspecified reason when we tried to visit. A shame, but it is there for next time. (Arrived 14.20) By this time everyone was very ready to eat! We headed to Psiri, where there is a nice square with a number of tavernas and restaurants. This was a chance for a big meal and a chat, and also to rest the legs for an hour or so! By the time we left the restaurant, it was about 15.45. With a sunset at 18.00 in February, and the main sites on shorter opening hours (15.00), I decided to take them to the indoor market. I think it was an interesting experience for them to see the fish and meat on display, complete with entrails, eyeballs, and pigs heads! Opposite the indoor market, is the fruit and veg market, where Lauren picked up a bargain with some very tasty strawberries which we all enjoyed later! Make sure to include a visit to the central markets on your own things to do in Athens itinerary! I decided that we should go graffiti hunting next in the Psiri area, and loop back to where we had lunch. There is no real exact science to this – You basically head down any side street and alley, and hope you discover something interesting! I think we did pretty well, and there were a number of street art designs I hadn't seen before. After the graffiti hunting was over, we looped back to Monastiraki station, where we spent some time wandering the side streets, looking in the shops. This is a good area to buy souvenirs and postcards if you are into that sort of thing. (Arrived 17.01) My brother had spotted a happy hour 2 for 1 offer on the square where we had lunch, and so we headed back there. This was another chance for a catch up, and we also had a couple of games of cards. As I am still not drinking (coming up to four months now! ), I enjoyed a coffee and a water! (Arrived 20.00) We stopped of at a kiosk on the way back to the metro station to buy some snacks, and then headed back home. I think the kids were pretty tired at this point, so we watched a film, had a couple of games of cards, and called it a night! Breakfast – After looking for somewhere to eat, we settled for breakfast from a bakery on the square itself. (Arrived 11.40) This was our ‘main site' of the day. I have visited the Ancient Agora a number of times before, and have a more in-depth article about it here >> Ancient Agora Sightseeing Guide. We started off in the Museum of the Ancient Agora first, and then wandered through the archaeological site until we reached the Temple of Hephaistos. This is by far the best preserved temple in Greece. The Ancient Agora is one of my favourite places to visit in Athens. (Started 12.40) After leaving the Agora, we took the walk around the Acropolis along the mainly pedestrianised street towards the Acropolis Museum. This gave Lauren a chance to look at some of the handmade jewellery and other handmade crafts being sold. Walking around the historic centre is one of the best free things to do in Athens no matter what time of day. (Arrived 13.00) This museum has two buildings, and we visited the ‘Annex' building. This has a temporary exhibition being displayed until May 2016 called ‘The Amazing Inventions of the Ancient Greeks'. It features machines based on Ancient Greek designs, revealing just how advanced our ancestors really one. I had visited this exhibition before in a different part of Greece, and in that one, there were a lot of ‘hands-on' machines you could interact with. I thought this would be great for the kids, but unfortunately, there were no interactive displays or machines here which was a shame. From a personal point of view, visiting this museum was handy though, as I am going to write about it for my next #museummonday article, which is part of a project to visit all the museums in Athens. (Arrived 13.30) This museum gives a good overview of how the Parthenon and other parts of the Acropolis may have looked thousands of years ago. Many people claim this to be one of the best museums in Athens. 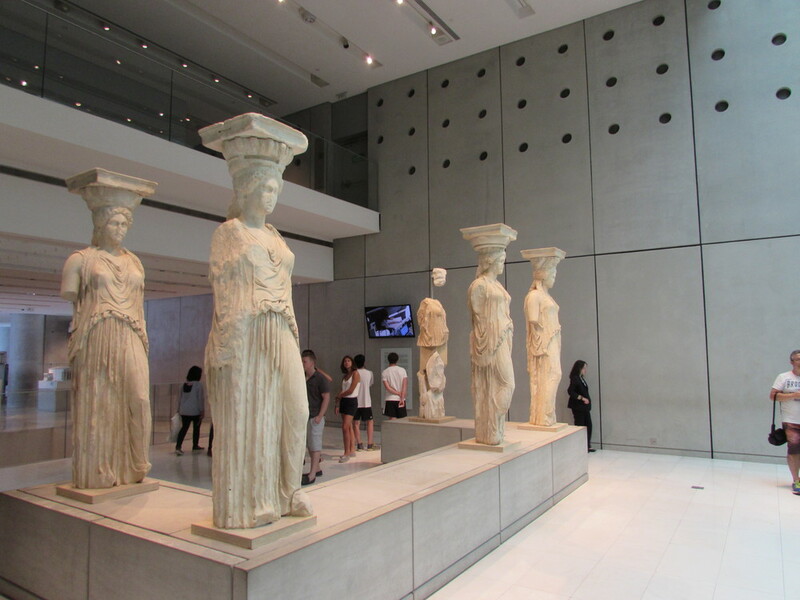 I have a slightly different, more controversial opinion about it here – Acropolis Museum in Athens. Still, I think everyone enjoyed their time there, and of course, we also talked about the Elgin Marbles! Lunch – (Arrived 14.40) We found a nice little restaurant called the Smile Family Cafe Restaurant near the Acropolis. Good service, and more genuinely priced than the restaurants on the main street near the Acropolis metro station! I also thought this might be a nice place to work from, so I may be return with my laptop at some point! Leaving the restaurant after the meal and a few games of cards at 14.40, we then went for a walk towards and around Plaka. This is definitely the area to head to if you want to buy gifts for back home, and Steve ended up with a Greek flag for the bar back in England. 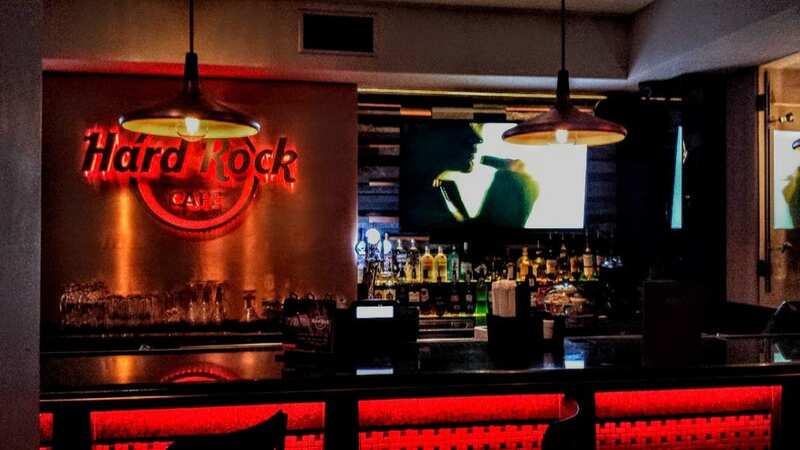 (Arrived 18.00 ish) We finished off in the newly opened Hard Rock Cafe near Monastiraki Station. They do a range of food and beer, and it was a nice little venue. It's not exactly a traditional ‘Greek' thing to do, but if you are into music and music memorabilia, it's certainly worth considering. What on earth a bass guitar from Wham was doing in there though, I have no idea! Note – Many people would choose to visit one of the rooftop bars in Athens instead. I'll write an Athens guide about rooftop bars at some point in the future! And that, my friends, is the exact 2 days in Athens itinerary we followed when my brother and kids visited. Could we have squeezed more in? Yes. Did we still get to see all the main sights? Yes. Does it leave plenty of things for them to see on their next visit? Yes it does, and they are welcome back any time! As mentioned in this guide to 48 hours in Athens, the itinerary is one that I actually used for visiting family. Of course, there is plenty more to see in the city! As I sometimes get asked questions in the comments below (and feel free to leave a comment! ), I've included a few answers to commonly asked questions about visiting Athens here. As with any major city, the more time you give it, the more you will appreciate it! Certainly, if you are into museums, Athens has plenty of them! I've been running a personal project to visit all the museums in Athens, and have so far reached 50 out of more than 80 museums I know about. If you were to visit even 4 a day, that would be 20 days in Athens! Seriously though, if you are a regular visitor who is spending time in Athens before moving on to other parts of Greece, then 2 or even 3 days is fine. I think 5 would be ideal, but only if you are a long-term traveller where time isn't an issue. My Athens itinerary is pretty easy to expand upon for people who want to spend longer in the city. 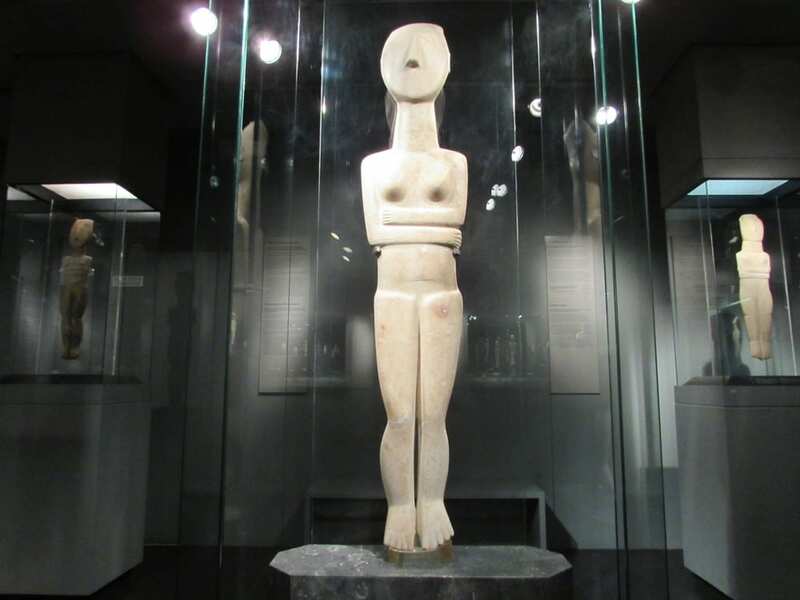 For anyone considering spending 3 days in Athens, I would suggest including Kerameikos archaeological site and museums such as the National Archaeological museum (worthy of a 3-4 hour visit) and Cycladic art museum. There's also the choice of taking one of many day trips from Athens. Take a look here for what to see outside Athens. I realise that there are also occasions where people only have one day in Athens. Normally, this is because of a cruise ship just allowing the one day in the city, or perhaps you just have day in Athens before catching a flight or ferry to one of the islands. Of all the different areas to choose from, I would say the best place to stay in Athens is near the Acropolis. This way, you are within the historic centre itself, and just a short walk away from all the attractions. Other nice areas to stay in Athens include Plaka, Monastiraki and Syntagma Square. If you are planning a trip to Athens, and are looking for where to stay, this blog post will be of great help. – Hotels Near the Acropolis in Athens. If you have any questions about things to see in Athens or would like help planning an itinerary, check out the comments below. Don't see your question answered there? Leave a comment and I'll get back to you! Thank you for such detailed information about Athens and Greece! My husband and I are planning our honeymoon in Greece in August. We are excited but a little overwhelmed while trying to plan a good itinerary. We are spending 3 days 2 nights in Athens, then flying from Athens to Santorini on the third day in the evening. We are looking for a hotel in Plaka. We will then spend 4 nights in Santorini. 1) We are looking at your two day itinerary for Athens and seems like we may follow most of it as it is covering most of the major sites. Is there any changes you would make since it’s just going to be the two of us without kids? 2) Any must sights/ activity to do in Santorini in your opinion? Is renting a car or ATV in Santorini the ideal transportation mode? Thank you for reading my comment and for any inputs you may have! I hope you’re enjoying the weekend so far! I wouldn’t suggest any changes to your Athens, but a more recent post I wrote might help you fill it out a bit more – 3 days in Athens. Renting a car for a day or maybe two is a good way to see other parts of Santorini. Have a great vacation in Greece! Hi Dave, I am visiting Greece from the 8th June to 24th June. We are a group of five women visiting Crete for one week, we are staying near Chania for four days and then Kissamos for Three days. I have never driven abroad, would you recommend driving in Crete or use public transport? Myself and my daughter will then fly to Athens on the 15th June. We want to spend 2 to 3 nights in Athens and the rest of it in the Peleponesse region. We want to visit Nafplio and Monemvasia. Is it possible to do it in seven days? and what kind of itenary would you recommend? Will we need a car? How safe is it to drive around the peleponesse. Driving in Crete may be an ‘experience’ for your first time abroad! My advice, is to only hire the car for when you need it – driving between destinations. Avoid driving ‘in town’ if possible. Driving is far more convenient than public transport. Nafplio and Monemvasia are tow lovely destinations in the Peloponnese. Might I also suggest visiting Mycenae (ancient site) and Epidaurus along the way? Driving in the Peloponnese is absolutely fine – getting out of Athens may be more of a challenge. For road trip itineraries in Greece, take a look here – Road trips in Greece. I am travelling to Greece in June this year. 1)How is the climate supposed to be there in June ? 2)Is sightseeing easy and possible via own transport ? 3)How easy is renting self driven cars and moving around Athens. What is a good operator you would suggest for renting self driven cars ? 4)Is the hop-on hop-off city tours and gourmet food tasting tours worth the money they charge ? Apologies for the delay in response – I missed you somehow! 1. I love the climate in June. Warm, but not insanely hot. Waters just about warm enough to swim comfortably. 2. Sightseeing in Athens is better done on foot. If travelling around the country, a car is best. Look here – plan a road trip in Greece. 3. Yes, you can hire cars in Athens easily. No specific operators to mention. You can either hire and collect at the airport,or arrange in the centre (note – it’s best not to drive in Athens itself unless you have to). 4. I don’t think the hop on is worth it unless you are coming in on a cruise and have limited time in the city (like a day). Food tasting tours are worth it for a taste of local cuisine, and can be combined with some sightseeing. This is a good example – Athens Gourmet Food Tour. Hi Dave Thanks for your advice. I had a feeling that the Plaka was a bit out of the way on day 2 but did not realize it was close to the Agora so i will follow your advice. I am heading off today for Myanma snd a slow boat trip down th Irawaddy from Mandalay to Randoon so I will follow up your advice on Santorini and Crete at a later date. We were there about a month ago. If you get the chance, spend some time at Inle Lake – probably our favourite area in Myanmar (apart from Bagan temples). I just recently came across your blog and WOW so happy I did. So, much useful information especially when you speak about the transportation in Greece and really thinking about those traveling with plenty of bags. My family and I will be traveling to Athens, Greece from March 28-April 2nd. The 28th we arrive pretty late to do any sightseeing (flight arrives around 18:00) and the 2nd we leave super early! Travellers include 6 adults and 3 children all under 3. 1. Would arranging a transport service to and from the airport be the best idea, being that we have 7 plus bag 3 carseats and a stroller or would you consider us renting a vehicle? 2. Would you recommend CitySightseeing hop on hop off tour bus to take us to many of the must see sights? or should we skip this option and better off using metro system? 3. Any specific tickets you recommend we buy ahead of time for certain sightseeing locations to avoid major lines? I hope you are well, and glad to hear you found the blog useful! 1. It sounds that because you are such a big group, a private transfer would be a good option just to make life easier. 2. If you stay within the historic centre of Athens, you can pretty much get around on foot, using the metro system probably a couple of times. In your case, I don’t think the hop on hop off would offer much value. No need to buy daily passes for the metro either – i think single trips will work out fine for you. 3. The major line is for the Acropolis tickets. 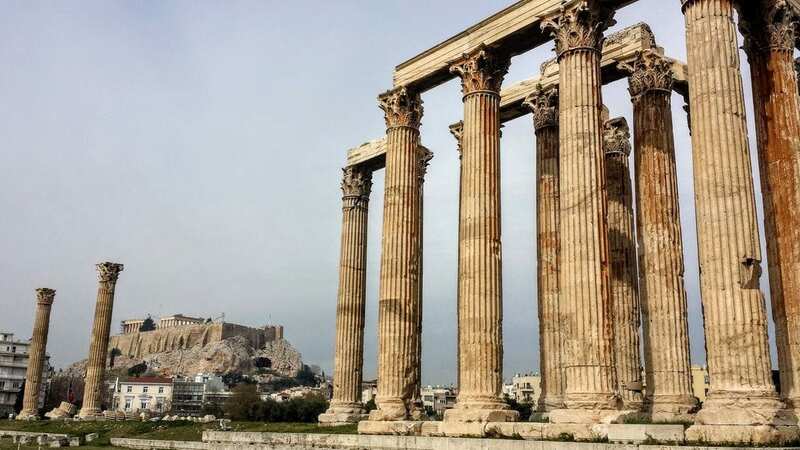 My normal advice is to include a visit to the Temple of Zeus first, and buy the combined ticket there which allows you access to the main sites. Additional – there is talk of an electronic ticket going to be available. Until I’ve tried it myself, I’m hesitant to recommend! Note – Students/kids/OAPs all have reduced rates and/or may be free for entry. Take relevant ids to prove age! I think your choice of Naxos for a trip with kids in Greece is an excellent one. It has nice beaches, history, is beautiful, and it’s a lot more authentic than Mykonos! Let me address safety first – I honestly believe that Greece is one of the safest countries in the world. When you get to Naxos especially, you will wonder why everyone is so stressed in other parts of the world! A common sense approach will see you all fine, and travelling as you are certainly does not make you a target. You’ll probably find quite the opposite actually. That said, there are always points when your awareness is lower than others – particularly after a long flight! For this reason, I would recommend a pre-booked taxi from Athens airport to the centre – Find out more here – Athens to city centre. For Cape Sounion, it is possible to do the trip yourself if you have a rental car, but I wouldn’t rely on public transport. More information on Cape Sounion options here – Visit Cape Sounion. I also found an interesting tour here – Cape Sounion Private Tour. If your kids are Percy Jackson fans, you could also Google my friends at Kids Love Greece – if you decide to use their services, let them know I directed you their way! If you have any questions, don’t hesitate to ask as I’m always happy to help. If you haven’t already, you might also like to sign up for my newsletter – Free Guides To Greece. Everything is open in January – just with reduced opening hours. For example, the Acropolis will close at 15.00 as will the Ancient Agora. The Acropolis Museum is open until 20.00 though, so you could leave that for the late afternoon. In terms of the multi ticket, I think it best you check when you get there. Last year, the entry tickets to all sites in winter was reduced by half, but the multi-ticket wasn’t – meaning you would have been better off paying individual tickets. If you head to the Temple of Zeus as your first site, you can ask them there and do a quick math check. You should be able to comfortable visit both the Temple of Zeus and Acropolis before 15.00 even with a later start. I’m planning to travel with a group of students ages 12-16. I want to get in as much as I can but only have 2-3 days. With kids I need a mixture of sites and activities. do you have any must do/see suggestions? I’d suggest a couple of outdoor activities like perhaps a sunset cycle tour. If you want something more specific, can I suggest you contact my friends at kidslovegreece.com (mention me! ), and they could perhaps put something together – I’m thinking about their Olympic Workout activity specifically. Day1: Fly from Santorini around noon to Athens. Get a rental car at the airport and drive to Delphi. Stay in Delphi. Day2: Tour Delphi. Drive to Olympia, stay in Olympia. Day3: Tour Olympia. Drive to Nafplio, stay in Nafplio. Day5: Tour Athens. Stay in Athens for another night or fly to Rome Italy. 1. Any suggestions on the itinerary? 2. Is rental car a good idea for four of us? Or public transportation a good alternative? 3. Will I need a full day in day 5 in Athens? I don’t want to arrive Rome in the dark. So if we need more than half day in Athens in day5, I would stay in Athens and fly in the morning to Rome. Your longest drive will be from Delphi to Olympia I think – but perfectly doable. Allow at least 1.5 hours sightseeing for both Mycenae and Nemea. Corinth has two sites – ancient Corinth and AcroCorinth – to do both allow 3 hours. You’ll probably arrive in Athens a little late to do anything, so I would suggest a full day on day 5. It will be far easier in a hire car than using public transport. With four of you, luggage may be a bit tight, so something to consider when choosing the vehicle. Have a wonderful time in Greece! PS – If you haven’t already, sign up for my free travel guides to Greece on this page! Hi Dave, I’m currently living in Thessaloniki and will be able to spend around 5 days on holiday. I am planning to arrive in Athens on January 2, 2019, and will tour the whole day. Would you recommend that I go to Santorini then just for a day trip on January 3? Are there any tourist spots or museums in Athens that I can visit in the evening when I get back from Santorini so I can maximize my stay? I’d question what you could do in Santorini for a day trip – but I’d love to hear from you to see how it went if you choose to go ahead! I think it comes down to how many hours you have on the island. You’d probably just want to go to Oia if you had only a few. Keep in mind it’s an hour from Athens centre to the airport in terms of travel time, let alone how early you might need to be at the airport. Jan 3rd is a Thursday I think – Check out the Benaki museum. There are several different buildings, some of which open til 23.30 on a Thursday – but you might want to check so close to the New year. As for the tour – probably a great way to see those sites in a condensed amount of time. Enjoy your tour of Greece! yes that’s a great time to visit! You can take local transport to see the sights you mentioned, although I think the Cape Sounion trip is more difficult, because you may not see the sunset when the last bus goes. And if the last bus goes, you are stuck! If you haven’t already, sign up for the newsletter (box in the article). I’ll send you out more emails about Greece, including day trips from Athens. We are planning a two day trip in Athens with two kids (6,3). I plan to stick to your itinerary. Can you please tell me what tickets I need to buy to get inside all these places you have mentioned. I will skip Hard Rock cafe though. And What transport you used between the places. Is there Uber or I need to rely on public transport? If you want to see an extra site as well (Kerameikos), then I would say get the multi-site pass for the ancient sites in Athens. Start off at the Temple of Zeus, and that way you will avoid the queues for tickets at the Acropolis. For your younger kid – Note that strollers/pushchairs are not really viable for the Acropolis. In terms of getting around Athens – This itinerary is all possible on foot. You would just need to get the metro in from where you are staying into the centre. If you are staying in the centre anyway, then it’s all possible on foot. There’s plenty of places to stop for a coffee, ice-cream so if the kids get tired walking around Athens, they can take mini-breaks. Uber doesn’t work in Athens (I don’t think). Use the metro wherever you need to – it’s clean and efficient and alos affordable compared to other European cities. Sign up for my free travel guides to help you plan your trip even more! – Free guides to Greece. My husband and I and our three kids (7,10,12) will be in Athens early June after a stay on Naxos. We are deciding whether to fly in on a Monday or Tuesday evening, as we are flying out on Friday at noon. While we are in Athens, we’d like to go to Aegina for a day trip. Would it be too rushed to do Athens one day and Aegina the other, with a couple of hours the evening we arrive and the morning we leave? Would prefer not to have four nights in Athens, but maybe that’s the way to go about it. Thanks! I’m just writing about Naxos now actually – what a coincidence! It’s a tough call – I think a lot comes down to the type of travellers you are, is it your first time in Greece, and do you think you will be returning to Greece? Probably with the kids though, it’s more important to think of what they might prefer as well! The short answer is sure, you can see the essential sights of Athens in one day (Acropolis, Acropolis Museum, Ancient Agora, walk around Plaka). It’s all pretty centrally located, and in June the temperatures aren’t too energy draining. Will you see and perhaps appreciate Athens on a deeper level? Probably not, but I hope it would give you a taste to return to see it again one day! My real question though is do you really want another island trip? You’ll already have been to Naxos (great choice for families by the way! ), and I guess probably Santorini as well? How about a mainland trip like Delphi? If you’ve not already, please sign up for my Greece travel guides. I’ll send you an email a day over a couple of weeks with little insights into Greece and other areas to visit. In the end there’s no right or wrong way to go about it – whatever you decide, I’m sure you’ll love your time in both Athens and Greece! Love your posts and emails! My friend and I will be arriving December 24 and so far I’ve noticed many things are closed the 25th and 26th. Although we are excited to be there we want to make the most of our time. Any suggestions on things that may be open or available on those days? I hope you are well and enjoying the weekend! Yes a lot of the archaeological spaces will be closed on those dates. If you have time, try to see what you can on the 24th! Unfortunately, your options are going to be limited when it comes to visiting archaeological spaces or museums. If you like admiring things from the outside (and actually the Acropolis looks better at different angles from outside), then this is the time to enjoy quiet strolls around the historic centre. You can come up with a route along the pedestrianised street that circles the Acropolis, and visit Plaka, Anafiotika, and more. 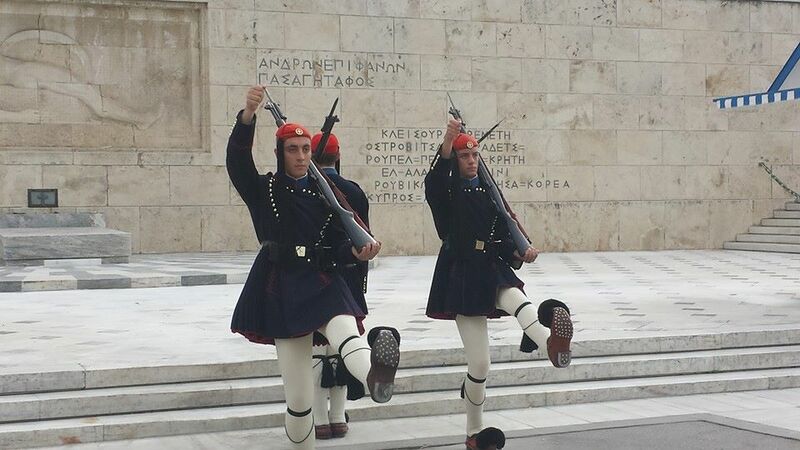 The changing of the guard also happens every day including holidays at Syntagma. After that, it’s more about social things – there’s a bar called Noel you should Google, and also a cool little cafe called Little Kook which is a must see. Sorry I can’t be more helpful – I think really it’s best to spend the daylight hours walking around the city absorbing the sights, and the evenings checking out any bars or restaurants that might be open. You could also contact the local couchsurfing community (which is quite active in Athens) – you never know, they might be organising a party or two! Dave, my husband and I will be in Athens for several days before embarking on a cruise of the Greek Islands. We arrive on a Thursday and leave for the cruise on Sunday. Trying to decide if a day trip to Delphi is worth doing, or if we are better staying in Athens and exploring the city. Your input will help us make a decision. Thanks! Personally I love Delphi, so I would suggest it! However, this probably only gives you one full day in Athens which I don’t think is enough. Whatever you decide, keep in mind that a trip to Delphi would be one full day, so you can best work out how to allocate your time. For 2, are the roads lit at night? This is difficult to answer – depends what driving conditions you are used to! If for example it’s your first time driving on the right hand side of the road in a new country, I wouldn’t necessarily suggest Athens is a good place to learn LOL. If you’re used to driving overseas, and are cool under pressure then you will be fine. The biggest issue in the center is parking spaces – so maybe check your hotel has somewhere to park. The road from Sounion back is semi-lit – but it is easy to follow with no undue hazards. Glad in came in useful – enjoy your 3 days in Athens! I’ll be visiting Greece soon and will have two days in Athens. Your two day itinerary is just perfect, exactly what I was looking for. Thank you for posting it. I’m heading to Athens tomorrow and just saw your 2 day itinerary. I am there for 4 days and am wondering if there enough to see and do. Any suggestions for 4 days! Please… would be much appreciated. I guess you’re in Athens now – so welcome!! You can definitely spread it out and see more – there’s tonnes of museums for example. WIth four days, I’d definitely check out the National Archaeological Museum (the best one in my opinion). Perhaps on day 4 though, you might want a day trip to Delphi. Hi Dave, Is there a way to print the 2 day guide in a condensed version without all the ads? I’d love to take it with me when we go to Athens in December! Thanks! We have been privileged visited Athens and several of the islands 7 times over the last 15 years, spending up to 12 days at a time. We totally agree with the things to see and do while in Athens and the corresponding day trips. One thing that we may add is take your time to really experience the culture, talk with the wonderful, friendly Greek people, and share with them. This is the land of Plato and Socrates, the birthplace of democracy. The Apostle Paul walked the streets of Placka and the Agora. He spoke on Mares hill. History is here as nowhere else . Take your time and allow Greece to fill your senses with what is real and beautiful. Yes we will be there this September for 16 days and staying at our favorite hotel the 360 Monastiraki having breakfast looking at the Acropolis , dinner on the rooftop and enjoying fabulous Athens. Hi Dave, me and my wife are planning a trip to Athens for 3 days. Would like to know how do we get around Athens generally? i can’t seem to be able to find a map highlighting all the attractions. Historic Athens (which is what most people would want to see during 2 days in the city) is pretty easy to get around on foot. The area is quite compact. There is also the Athens metros system which is an excellent way of getting to and from some of the suburbs. Take a look at another Athens website I’m working on. We’ve put a map here with some of the places highlighted as well as free things to do in Athens! You Greek holiday is getting closer! Kolonaki is an upscale area that is a nice place for food as well. Also take a look on Google for ‘This is my Athens’. It’s a city scheme with volunteers who show people around the city based on your interests. They will try and match you with someone who has shared interests. Should be enough there for 4 days I think!! Hi there. We’ve recently spent a few days in Athens and found your guide to be really helpful!! I was a little daunted before we got there, by how far things might be away from each other. Once we were there, we realised that there was no need to worry at all. Things were a lot closer than they seemed on the map. We walked everywhere and soon knew our way around! We absolutely LOVED Athens and would come again anyday!! Thanks again. So glad to hear that you enjoyed Athens – and that this guide on things to do was useful for you! I hope you get the opportunity to return both to Athens and Greece again soon! I just found another museum in Athens and I am so excited to tell you about it. It only opened recently: January 2018 I think. Well it is actually two museums, but I have only been to one. You cannot do both Museums together because there is a lot to see and think about. I went to The Museum of Ancient Greek Technology and it is, in my opinion, the BEST museum in Athens. If you visit, you need to take time to understand how each invention worked. There are written descriptions and videos that make things clear. Thanks for your amazing guides. Me and My wife are planning to visit Greece, we have 6 nights 7 days. We reach July 31st afternoon around 12PM. We are planning to visit Athens and Santorini on our trip. I am debating the number of days we should stay in Athens vs Santorini. Do you think we should stay in Athens for 3 nights (rest of July 31st, all of Aug 1 and 2), depart to Santorini Aug 3rd morning, stay there Aug 4th, 5th and depart on 6th morning to our next destination. Or do you think it is enough to stay Half of July 31st and Aug 1 in Athens, then depart for Santorini on Aug 2nd. This way we get 1 more day in Santorini. We are not planning to do any day trips from Athens. I think this depends on your interests. I believe that spending a little longer in Athens would be better though, as just 1.5 days in the city would be a little rushed. 2.5 days in Santorini is probably just about the right amount of time especially in July/August. My husband and I with our 2 daughters will be travelling to Athens on October, and will stay there for 5 days and will definitely following the iterinary you have. We will be arriving late at night on 22nd and would take taxi going to our hotel in Elpidios. Should we get a travel pass to use from 23rd til 26th? ( We will be leaving on 26th afternoon). Taking into considerarions the iterinaries you have suggested? by the way still thinking of places to go on the 25th. 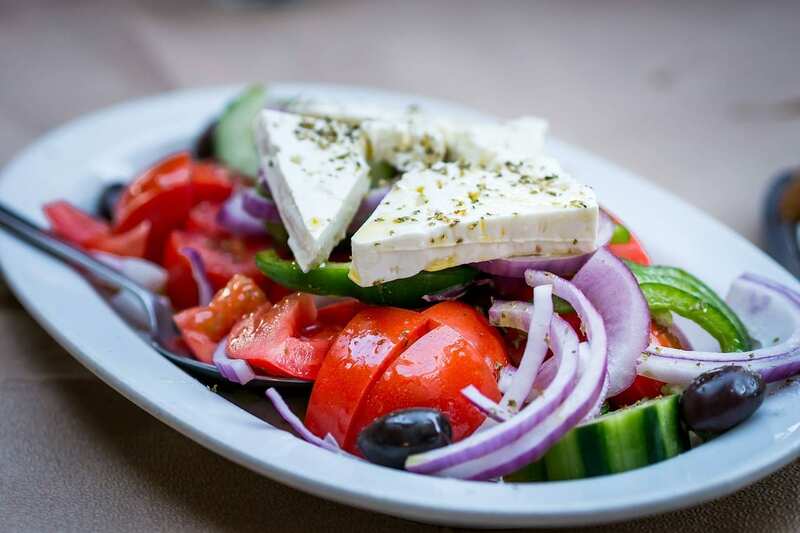 Do you have any suggestions where we can go to get and enjoy greek foods in affordable costs. Thanks in advance. In terms of a travel pass – do you mean for the metro system? I think it depends on how old your kids are and how much energy they have, but maybe a pass isn’t really worth it for the metro. If you mean a general travel pass with access to museums and things – I’ve seen a couple of travel passes for Athens about, but unless you cram a lot in, they rarely offer value. If your kids are young, they are likely to get free entry or reduced entry to most places in any case. You’d need to do the math on that one! For the 25th, and depending on where else in Greece you might be heading, I think a day trip from Athens might be nice. Perhaps to Delphi or to Mycenae (Delphi is th more traditional of the two). For Greek food – well, you really can’t go wrong! I’d personally avoid the obvious tourist places around the Ancient Agora. You might like to try Mana’s Kouzina-Kouzina or Klimataria. I’m due to write a food guide for Athens. If I get it written before your visit, I’ll put a link in here somewhere! Hey Dave! Thankss sao much for this detailed itinerary. I have been going crazy researching tours, museums and things I want to see. The tours are pretty expensive so this really helps a lot. Where can I get the pass to see all of the museums instead of paying separately? Also, is the metro pretty easy to read? This is my first time in Greece and I’m making the trip alone. I’m spending 2 days in santorini and 3 days I’m athens. Is there anything else you recommend for a traveler on a budget lol. Thank you! Hope you are well! I just noticed a separate email which I think might also be from you – I’ll answer briefly here and then in more detail in the email! Museums – there is no museum card as such which gets entry to more than one. If you are a student though, bring your ID card as you will get discounts. On Thursday, some museums may have free entry such as the Benaki. The metro system in Athens is very easy to use. Everything is clearly marked, and it runs well. It’s probably one of the best metro systems in Europe actually! For a traveler on a budget, Athens is a great choice – you can spend you time wandering around, food is affordable and very tasty! Make sure to try the Frappe or Freddo Espresso – cold coffees which are really the modern day Greek coffee! You can pick one up for less than a couple of euros. Enjoy your time in Athens! Hi Dave, Thanks for a great 2 day guide for Athens! We are headed there later this month (first time to Greece) and looking forward to it. Since we only have 3 nights (and departing on early morning 0620hrs) flight to paris, do you think we are okay staying in one hotel all three nights or should we move back to the airport area? we certainly don’t mind getting up early, and thought staying in one place might be easier than having to check out, store luggage to tour, and then move to a new hotel. At 0400hrs on a Monday morning how long to the airport from an Acropolis area hotel? Glad you found the guide of some use, and I hope you have a great time here in Athens! Getting from the airport to the centre of Athens. The metro won’t be running so that’s not an option. The X95 bus from Syntagma Square will be running, and would take about and 1 hour 20 minutes. I think it depends on how much you value that extra hour in bed really! Personally, I would just stay in the center. Have a great time here, and I hope you get some good weather! WOW! thanks dave this is exactly what I was looking for. I have two days in Athens at the end of an island tour and was curious as to whether I could do “it all” and it looks like I can! do you have any recommendations on where to stay to get the most out of this itinerary? I’m glad you found this guide to Athens useful, and hope your enjoy your time in the city! For places to stay in Athens, somewhere near the Acropolis might be a good idea. There’s a selection of hotels to choose from here – Hotels in Athens. Hi Dave, I will be visiting Athens with my wife at the end of March for our wedding anniversary. We are there for a whole weekend, arriving Friday leaving on Monday. During your itinerary above you only spent an hour and a half at the Acropolis. We are both in our sixties and fairly mobile but surely you wouldn’t be able to see much in that time. How long should we allow to explore this site? March should be a great time to visit Athens, and I hope you enjoy your time here! Of course, you can take as long as you need/want at the top of the Acropolis Hill. In my opinion though, once you are at the top, an hour and a half is more than enough, unless you want just to take some time out up there in a quiet corner and soak up the vibes. If you allowed between 2 and 3 hours to walk up and down and spend time at the top it should be more than enough. In fact, I would love to hear from you after you visit, so you can let me know how long you spent there! Just found your site..great info. I’ll be in Athens in May but havent started planning an itinerary. Your site will be useful. Thanks! Glad to hear you’re visiting Greece! The schedule certainly does sound like a bit of a whirlwind, BUT, I think you can see all the main attractions, and I’m sure there you’ll want to return to see more! So, as for the 48 hours in Athens – Even if you are first timers to the city, I’m pretty confident you’ll find this 2 day itinerary easy enough. Most things are centrally located (in terms of must see attractions in Athens). Turn on Google maps to help you stay on track and you’ll be fine! In terms of places to stay, staying somewhere central makes the most sense. Here’s my guide to the best hotels near the Acropolis. Santorini for 72 hours is also the perfect amount of time to spend there. I’ve got a 2 day guide to Santorini here which you could cherry pick things you might not have thought of. The trickiest part of your tour is actually going to be Crete. It’s the largest of the Greek islands, and I often describe it as almost it’s own country! I think with 72 hours, you are once again going to need to boil things down to highlights. The Palace of Knossos will certainly be on your list I suppose, as might be spending time in Chania. If you’re looking for additional inspiration on places to visit in Crete, you might want to check out this guide to road trips in Greece. Towards the bottom of the page, I go over a 2 week road trip plan in Crete, from where you might want to add a few destinations to your own itinerary. I hope I’ve helped you out rather than given you information overload! Hello Dave. Your 2 day sightseeing itinerary is exactly what I was looking for. I’m starting a tour over western Europe within 2 days and I decided to take some time to visit Athens. I’m gonna have 2 and a half days and I’ll definitely follow your tips… My question is regarding it being so close to winter and how it would affect the itinerary. I’ll be landing in Athens December 2nd. I think I won’t be facing any snows but what about the weather? I usually like the cold (not like canadian winter of course) but are the trading hours affected since it’s early december? What about the attraction hours? I’m sure I’ll be facing early sunsets and probably will have to rush a little bit to enjoy shorter daylight but will it be a dealbreaker for the itinerary? Thanks for any help! Cheers. 2.5 days is a perfect amount of time to see the highlights in Athens. Weather wise, if you are coming from Canada, you are probably going to find it quite warm! The average temperature for the daylight hours is around 14 degrees, with partly sunny skies. At night the temperature does drop. I very much doubt we will get any snow before January. Rain – We can get quite heavy rain here that suddenly appears as if from nowhere. A collapsible umbrella might be a good investment, and you can pick one up from street sellers for a just a few Euros. The archaeological sites do close early at this time of year – The Acropolis should be open until 5, whilst some of the smaller sites may close at 3. I would suggest tinkering with the itinerary so you visit the archaeological spaces in Athens in the morning, and leave the museums for the afternoon. I hope you will enjoy your days in Athens! I will be in Athens for just over 2 days (arrive early afternoon December 6), leave for Crete on Dec. 9. I’m wondering if I should soend the whole time more or less using your 2 day itinerary ideas which are very helpful, OR should I use my second full day (8th) for a day trip to Delphi. I wonder what the route and roads are like this time of year esp. after all the rain and flooding. Hope you are doing well, and looking forward to your trip to Athens. Based on the itinerary you mentioned, I would say to keep your time for Athens itself. Whilst you can do a day trip to Delphi, it would take a whole day, and you are going to end up spending 4 hours minimum sitting on a bus, which would be a shame I think. Instead, why not do more or less the itinerary I mentioned, but also tie in an afternoon tour to Sounion to see the Temple of Poseidon at sunset. I think overall that would be the best use of your time. The routes and roads are clear and serviceable all through the year. The rain and flooding you mentioned was certainly a tragedy, but was relatively isolated and the locations would not affect your trip. Right now here in Athens (26 November 2017), it’s a bright sunny day at 19 degrees (66F). Me and my husband are planning to come to greece for about a week in november. We plan to go to Santorini also during the trip. We will reach at 15;30 hrs local time at Athens on day 1. After that we have 6 more days to explore Athens and Santorini. According to you what should be our itenerary to visit maximum attractions in and around both these places. It’s really going to depend on how long you want to stay in which places and why (such as your interest etc). You will also want to make time to fly back from Santorini for your connection. I would suggest 4 nights in Athens (include a day trip or two), and the rest of the time in Santorini. 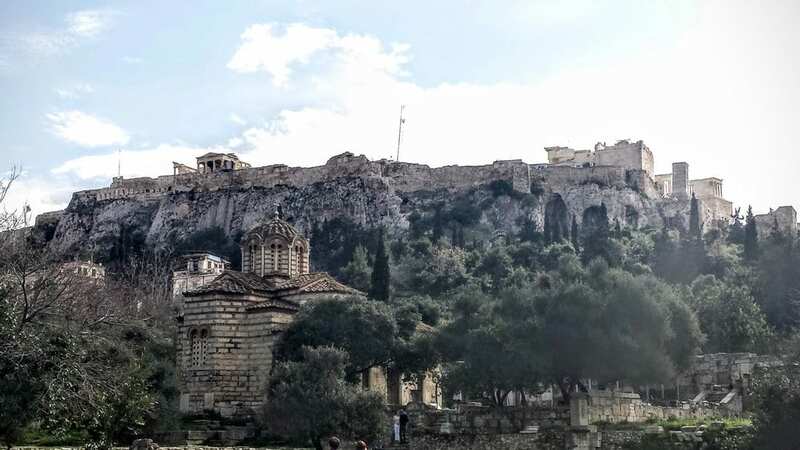 My 2 day guide to Athens will take care of the highlight sin the city, and you could choose from these day trips from Athens for other activities to try. I would suggest a trip to Delphi, and possibly Meteora. This short guide will show you some of the things to do in Santorini. It was something we were working on a while ago, but is aimed as a free walking route to see ancient Athens. It’s a starting point for you at any rate! My husband and I spent last weekend in Athens and used your list. It was easy to follow your recommendations and enough sightseeing for 2 days. Last evening we skipped the Hard Rock, instead we had a few cocktails in 360 cocktail bar (www.360hotelathens.com). This place is is exactly opposite the Acropolis, amazing view!!! I am glad I found this site, all the best! I’m so happy to hear you had a great time in Athens, and that my guide helped. The 360 bar has wonderful views from the top, doesn’t it?! I’m thinking to write a blog post about roof top bars in Athens soon. Also happy to hear the street art is still there! Some gets replaced from time to time, but certain pieces seem to be ‘untouchable’ by local artists. All the best, and I hope you return to visit Athens again soon! I am glad i clicked on this site, Everything is so useful. we have planned a trip to visit Greece from 15th to 24th October this year. my itinerary needs a little bit of fine tuning and I am sure you will help. we arrive in Athens on the 15th midday and fly out to Santorini the same night and will be spending two to three nights there and take the ferry to Mykonos for another two to three days and then head back to Athens for the night (arriving in athens by 8am) this way we have a few hours on the first day of arrival in Athens and a full day. Then we plan to take the train ride to Meteora and stay over night and return tp Athens again. and then fly out. Is this itinerary worakable? is there a better way to travel to meteora? At first glance you have one issue, which is the few hours you have in Athens before catching the flight to Santorini. The airport is on a good day an hour away from the center by taxi (which would be your best option in this case). So, you have an hour there, and hour back, and then you need to check in for your Santorini flight (maybe 2 hours). That takes up four hours of your layover. If you want to visit just the Acropolis, I would say that 2 hours is the minimum time needed. So, if your layover is 6 hours or more, then it’s certainly worth it. Leave your luggage in the airport (maybe they will even check it straight through when you check in the first time), and then get a taxi to the center (check the set price covers to the Acropolis – I think it should). When you have finished, get another taxi back to the airport. You can find out about Athens airport taxi prices here. Check in for next flight (recommended 2 hours before). When you arrive back in Athens at Piraeus port, you have the day ahead of you. You can see the remaining main attractions that you like from this article. You could even get the Hop on Hop Off bus for the day, which might be an idea? If you get the train to Meteora and want to stay overnight there, you might like to take a look at this selection of hotels in Meteora. The next day, you might like to organise a tour to take you around Meteora. Meteora Thrones are a good company, and you can see the monasteries and mountains from a variety of different angles. I’ve written a short guide to Meteora. Thanks for the tips – where (in which area) would you suggest we look for affordable accommodation close to the 6 attractions above? I’m great thanks, and hope you are doing well also! I’ve got two guides you might find useful. The second is for budget accommodation in Athens. My opinion is that staying in the historic centre makes sense, as you will be able to make the most of your time. In terms of affordability, a lot will depend on what time of year you visit. it should give us both 15 pounds when you complete your stay. Enjoy your time in Ahens! Hi. Going back to the days of flying in to the old Athens airport, we used to store our bags & get a cab to Glyfada to while away a few hours between flights/ferries. Can you suggest anywhere similar on the coast from the new airport where we could go & would cabs be plentiful? HI – the new airport is in a bit of a weird place, so I don’t think a beach break is really all that possible. Of course, there are plenty of cabs from the airport. If you REALLY want to hit a beach, you can try Rafina (this is our ‘local’ beach actually, although not the best by any means), or any of the beaches around Marathon. Thank you for your posts, these are really helpful. The various articles are very clear and sufficiently informative. Need you advice on what is the best way to utilise the 4 days stay in Athens. – D-1, We are landing at the midnight of Friday/Saturday in Athens (lets say Day 0 i.e. D-0) and move to a hotel in city center of Athens. After waking up and getting ready by 10 or so, I am planning to spend the day (D-1) in Athens. – On D-2, Travel to Meteora, visit the place and spend a night there. – On D-3, Travel back to Athens and spend night there. – On D-4, Spend the day in Athens and take a late evening flight from Athens to Santorini. Then Santorini to Mykonos and finally the return flight from Mykonos itself. ?? After reading your blog on Temple Of Poseidon and Cape Sounion, I am getting tempted to visit that place as well. Thinking of visiting the place in the evening of D-1 which means that we will have only first half day of D-1 and more than half day of D-4 to see Athens. Does it makes sense for us to visit “Temple Of Poseidon” especially when we will be going to Santorini and Mykonos later on where we will be seeing many beaches and sunrise/sunsets? And is remaining time sufficient to cover must see in Athens with the kid? ?? Also, Can we squeeze in some other place in Athens-Meteora-Athens Trip? Let’s say Delphi – one of my knows told me that Delphi is not Toddlers’ friendly place. So, I was not sure if I should visit Delphi or not. ?? Finally, is it worth to take rental car during those 4 days or it will be better to use public transport – it is costing me for around 300 Euros, including petrol for travel to Meteora (estimating 2 full tanks)? I was planning to use the car only for my airport transfer and to travel to Meteora. And now, Temple of Poseidon – if it is doable and worthwhile. You have a number of interesting questions, so let me answer them in no particular order! I think overall you are right in saying that Delphi is not an ideal place to visit with a toddler in a buggy, but if you don’t mind carrying them a little, it should be fine. The same with Meteora. In fact, I think you would be better to combined Meteora and Delphi together on maybe D2 and D3. Tours are available if you don’t want to hire a car. In terms of sunsets – I think the temple at Sounio is a very special place, but in Santorini you will also have some very nice ones. It is for sure an evening trip, but the trip out normally starts at around 14.00 – and it will involve a total of about 3 hours in a car. You must decide if you think that is a good use of your time or not! For the hire car – i think the flexibility it gives you makes it better value for money in the end, especially as you can drive freely around Meteora and of course take the trip to Sounio as well. Really though, you can’t go wrong. I am sure you will all have the time of your lives whatever you choose! I will go with car then. Is Delphi and Sounio doable on the same day i.e. D2 while returning from Meteora? 3. Then from Delphi to Sounio? Also, how are the roads in the country? Was reading in few blogs that it is really difficult to get out of and in Athens in the car? BTW, I would rate myself a good driver who is driving from almost 18 years and have driven in different countries. The roads are very good – stick to the toll roads as it will be quicker. Yes, Athens can be challenging, but Google maps knows everything!!! We’ll go to Athens on December 2017. I have a question: should we book all these attractions or they’re free? You don’t need to book anything in advance, but some things will need tickets such as the Acropolis in Athens. Hi -I guess every situation is different. My initial thoughts are to make sure you do the Acropolis as early as possible in order to avoid the heat. Please note – The marble is VERY slippy in there. I have seen more than one person slip over. Make sure to exercise caution when walking at the top. Enjoy a long lunch (2 hours) in Plaka. Make sure you have a big hat! 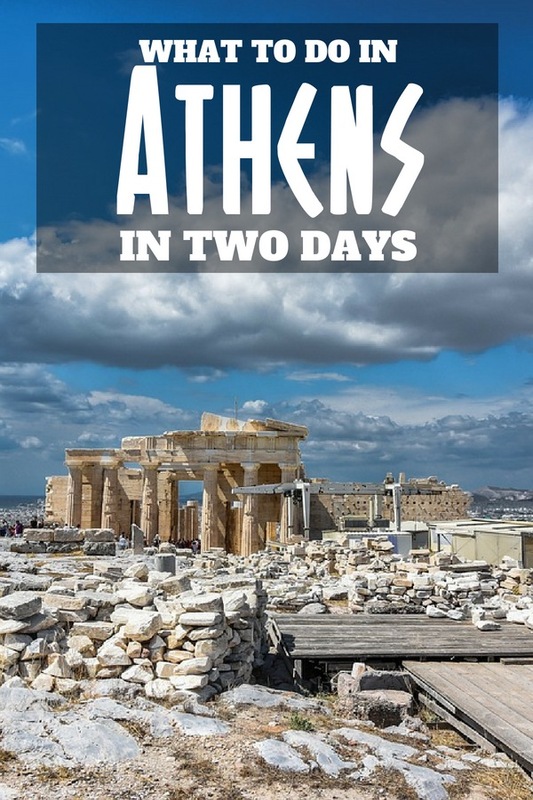 This 2 days in Athens guide has all you need. Not sure how else I can be of help! This is exactly what I was looking for thank you! I am traveling to Athens and then to Santorini with my girlfriend my mother and aunt who in their 80’s (my mom and aunt not my gf lol). I like the tips about museums when it is hottest. I guess I just wondered if you had any tips for traveling with older people ie. senior discounts, best transportation ect. They are pretty mobile I just don’t want to wear them out before we get to Santorini (which I’m already looking into hotels that don’t have too many steps). Ok thanks! Keeping out of the sun during the hottest part of the day will help everyone for sure. I would also recommend tackling the Acropolis as early as possible, as the climb up is not to be underestimated! As seniors, they will be able to take discounted tickets – They may need their passports on them to prove their age. Although I believe that getting around on foot and with the metro is probably the best way to see the city, there may be a case for the Hop on Hop off bus in Athens. Santorini is a beautiful island, and I am sure you will love it there! I’ve got a brief summary guide here you might find useful – 2 days in Santorini. A lot of the hotels in Santorini are quite small, and lifts/elevators are only found in the newer ones. I’m sure you probably found something by now, but this one looks like a good starting point – Canaves Oia. Enjoy your vacation to Athens and Santorini! Dave, I loved your travel pages about Greece. Our family (me, my husband and older 2 teen kids) will be doing a 2 week holiday this July in Greece and would like to pack in a lot. Your suggested itineraries will help a lot! Great suggestions! I’m glad you found some of these pages useful. I hope you enjoy your time in Greece in July, and if you have any questions before you arrive, just send me a message. My friends and I will be in Athens tomorrow and we will be staying for 2 days and 2 nights..and I thank you for your page , this will be of great help for us!..How about the weather, cold?what clothes are suitable to bring? Thank you !Have a nuce day! I hope you enjoy your time in Athens! Right now (Thursday 16th March), it is advisable to bring a jacket for the evenings which are still a bit chilly. You may also want one during the day as well. We have had occasional rain over the last few days, so if you don’t have an umbrella of your own with you, you might want to pick one up from a street seller (probably less than 10 euro). I enjoyed your travel page. My wife and I along with our 18 year old son will be coming to Athens in March. We will arrive on Thursday afternoon so will probably just relax after our long flight. We will be there on Friday, Saturday and our flight leaves Sunday at 4:30pm. My question is what time should we head towards the airport on Sunday. We are flying to Naples, Italy. Thank you and we will definitely be using your 2 day itinerary. I’m glad you found this page useful! If you are leaving on Sunday, try to make time to see the Evzones Changing of the Guards in front of Syntagma Square at 11.00 – The ceremony is much more elaborate at this time than the usual, daily hourly one (check this video here – Changing of the Guard in Athens). The journey from the centre to the airport takes from between 1 hour and 1 hour 20 minutes depending if you want to use a taxi, bus, or metro. Taxi prices are regulated to the airport – ask your hotel for details. If I was flying at 16.30, I would probably choose to leave between 13.00 and 13.30. If you get to the airport early, there are a couple of art displays and museum exhibits to check out on the top floor (the same level as McDonald’s). I am very happy to hear that you enjoyed the blog, and are visiting Athens soon! If you are in Athens for 2 days in February, it is important to remember that some of the main archaeological sites will close at 15.00. You may need to plan your day around this. If you stay somewhere near the Acropolis, you can make the most efficient use of your time, as you are right in the center. In my opinion, you do not need to take a tour. You can easily see everything in the city yourself. However, what a tour will do, is give you more information about the places you are seeing. You have to decide if the extra money is worth it! Your idea for the evening trip to see the sunset at Sounion is a good one. You could find out more about it here – Sounion tour. I hope you enjoy your stay in Athens! This facebook page posts regular updates about Athens and Greece – Real Greek Experiences. I love your post. I’m going to Athens in a few weeks and I wanted to know where would I purchase the tickets ? Did you take the metro to one place and then walked? How complicated is the metro system? Hi, I hope you enjoy your time in Athens! The combined ticket is available at the archaeological sites. You will find it easier to purchase the ticket at the Temple Of Zeus due to the queues at the Acropolis ticket office. remember to ask for the combined ticket! This looks great and we will follow your suggested route when we come next week. Do you hire yourself out as a tour guide at all? I hope you like Athens when you visit! Just to let you know, it’s super-warm right now, so you might want to squeeze in the more active outdoors things at the Acropolis etc early on. Enjoy your stay, and the weather!! enjoying your page and all the info you’ve got. Am travelling to Athens end of August for a month long cycle tour of the Peloponnese. Would like to know, arriving at the airport, what would be the best way to get with a bike box to the hostel in city center? Can I take the box with me on the train (Proastiakos), or maybe even on the X95? Or would it be better to assemble the bike at the airport prior to boarding the train? The Peloponnese is a wonderful area of Greece to cycle, and you have picked a great month (September) as well. The tourist crowds should have gone back to work, and the temperature is just starting to drop to the mid-20’s. Lots of hills though! In regards to the bike/box, I have had a think about it, and I believe that getting it to the centre on the train is perhaps your best option. Cycling would be the next best option, and taking a bus the worst. In regards to getting it on the train – Keep in mind that the metro system is underground, so there are stairs and escalators. That said, you should cheekily be able to get away with using the elevators. Also, the train stops running around midnight (keep a watch out for local strikes affecting transport as well). Moving it around fully assembled would be your best option. You would just have to find somewhere at the airport to ditch the bike, and then of course find another bike box before your return journey. Good luck with your journey, and don’t hesitate to ask if you need further info. Do you think it would be worth it to take the hop on/hop off bus? Or should we follow this itinerary with public transportation? Thanks a lot. I’ve never taken the hop on/off bus in Athens, but my opinion is that the metro system is a more fun and interesting way to get around. Each metro station has unique designs and modern artworks, and some even have archaeological collections in them! I enjoyed reading your 2 day itinerary as myself and husband will be in Athens for 2.5 days in mid August. Its our first time and we are very excited! In saying that I realise its going to be very hot at this time of the year and we want to see/do as much as possible. I liked some of the things you did with your family but am thinking during the middle of the day should we be doing the museums and nothing outside? I mean how hot does it get? Our hotel is next to the Acropolis FYI. Yes, it is going to be VERY hot in Athens at that time. There have been several heatwaves already this year ( 40 degree +). You are quite right – you should visit museums during the peak heat of the day (12.00-15.00). Also, this is a good time to check out restaurants in the shade! The real good news is, that Athens may be very quiet when you visit at that time. The vast majority of Athenians take their summer holidays at that time, and drive out to the coast. This means you can enjoy the city and all the sites, with none of the traffic and crowds! Note – Many of the archaeological sites will be open until 20.00 in the evening, meaning you will have a lot more time to see them when it is cooler. I hope you enjoy your days in Athens! I’m visiting Athens with my family in September. We will be staying in Marathon, Nea Makri. We have about 3 days to explore Athens. We will follow your itinerary for the first two days. Could you recommend anything else to do on day 3. Also, would you recommend a tour guide at the Acropolis? As for the tickets – you are correct in that there is a combined ticket which gives you entry to all the places mentioned (and a few I have not mentioned on here, but I have written about elsewhere such as Kerameikos. Basically, the more sites you visit, the more value for money you get! As for the ticket price itself – It is currently 12 euro. however they are due to put the price up at the beginning of April. As far as I am aware, the new price will be 20 euro, although this still needs to be confirmed officially. April 18th you might be able to get free entry to all the sites, (an international monument day) but expect it to be busy. hope that helps! If you need any more advice, just drop me a line! Cheers. Dave, this is an amazing itinerary. I am visiting Greece with my family in August and we will probably have two days in Athens, and I have been wracking my brain trying to work out an itinerary with the kids. Have you been to the Allou Fun Park? I was thinking of going there on our last night in Greece. As for Allou Fun Park – I haven’t been myself, but I asked a couple of people that have. They said it is a park of fun rides, speed, adrenaline etc! It’s most suitable for kids of 13 years old. I am not sure which country you are from, but this is more of a European fun fair park than an American theme park if that makes sense? Wow! It’s amazing all you can do and see in just two days! Great list! Great tips! 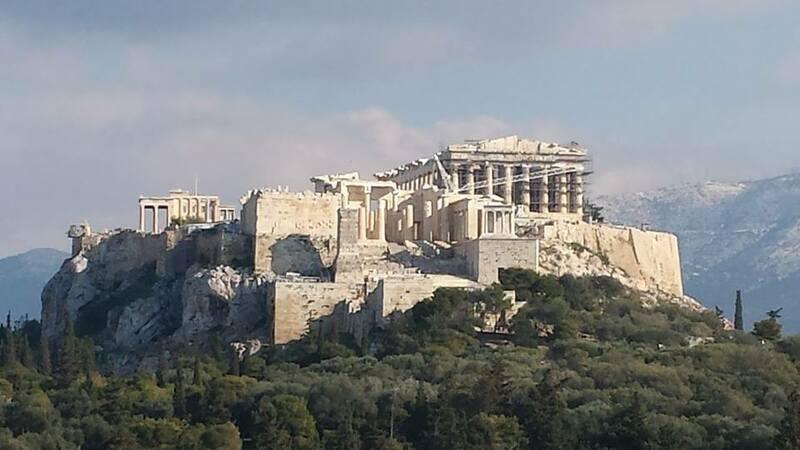 We only had one day in Athens during a cruise and though we saw several of the major sites – I wished we had more time! Eventually I will get to Athens. Your itinerary looks solid and I would probably do most of the stuff you listed. 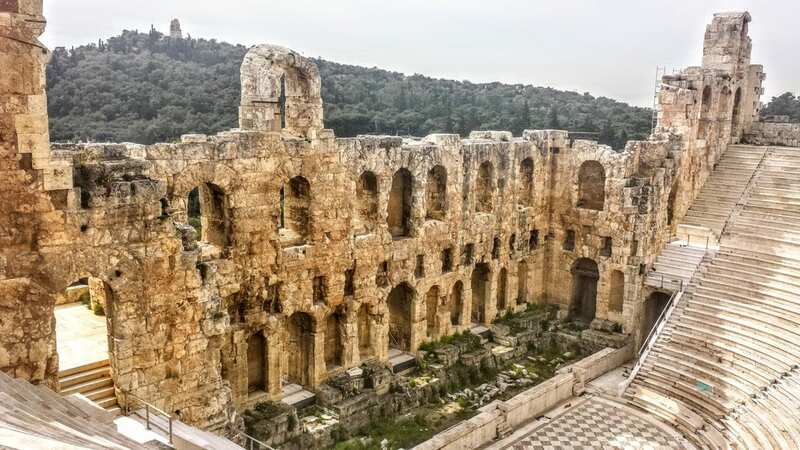 I am particularly interested in the Acropolis and Parthenon, Acropolis Museum, Ancient Agora and of course I would love to sit and relax at the Hard Rock Cafe. So now I’m not only disappointed that I missed the museums but the street art, too! That is awesome! Everything else I would agree on but not sure everyone can keep up with that pace. That is alot of stuff. lol I loved the changing of the guard and wonder if there is a name for that kick/flip/foot flex thing they do. It was a pretty gentle pace overall, so next time you visit Athens, give it a try! I’ve been reading your articles about Greece and really makes me want to go there. I like history and ancient civilizations, so Greece is a more than a natural choice. Would love to visit the Acropolis and the museum. I don’t think I’ll be able to visit this year, but I’ll do my best! I love itinerary posts and this is a really great one! I love getting tips from a local (and I certainly feel that after living in a city for 1 year you can share some inside knowledge;-). Bookmarked it! Great itinerary! We were only in Athens for a day, coming in on a cruise ship. All we had time to see what Acropolis and Parthenon. I’d love to return and spend more time exploring the other areas. 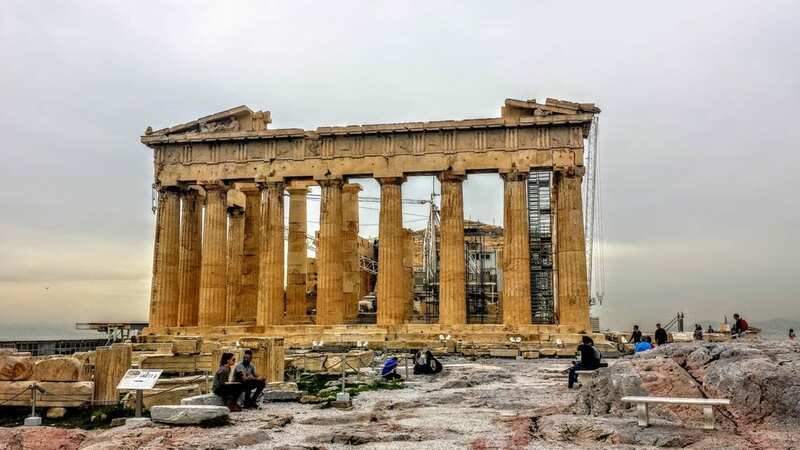 Well, there is definitely still much more you can see, so visit Athens soon! Other than the things to do I have listed here, perhaps at night, you might want to head for the Kerameikos area. Oh, and see the Acropolis lit up at night as well! Well, it is always nice to spend as long as possible somewhere, but certainly all the main places can be visited in just 2 days if needed. Let me know if you decide to visit, and I can put together an itinerary for you!